Some organizations provide sales scripts to their sales reps to have conversations with prospects at various stages of the buyer’s journey, usually as part of an overarching marketing campaign. This is met with varying degrees of success if sales and marketing teams didn’t collaborate in advance or if the sales reps come across as inauthentic. 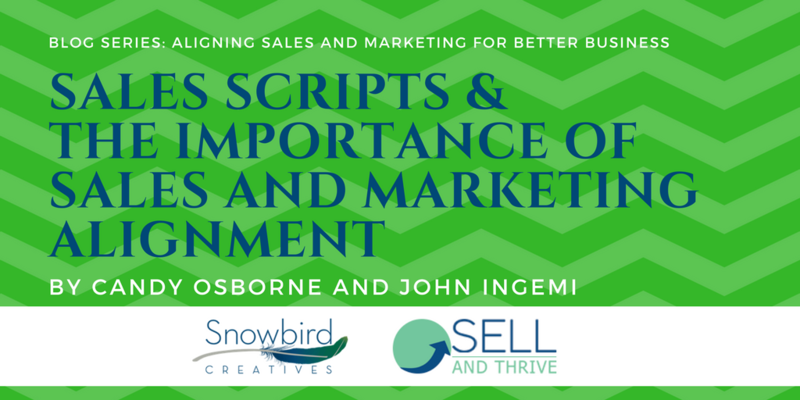 In the series Aligning Sales and Marketing for Better Business, two business owners share the expertise of their respective profession: Candy Osborne (marketing, via Snowbird Creatives) and John Ingemi (sales, via Sell and Thrive LLC). Why do organizations feel the need to provide sales scripts to their sales reps? John/Sales: In my opinion, the answer is obvious: control. Distilling this down, I would say safety and control. When you think about it, a company has a Go-to-Market Sales Strategy which is handed over to the sales and marketing teams to execute. This Go-to-Market Sales Strategy is usually created by senior management in a boardroom and is based on assumptions, data, forward-looking goals, and past experiences. Once senior management creates this Go-to-Market Sales Strategy, the strategy leaves the boardroom, or as I like to say “the vacuum” and becomes the responsibility of mid-level and junior people to execute. Because senior management has spent considerable time and effort to create the strategy they want it executed exactly as they planned. This is why my initial answer is control. Let’s face it, what member of senior management does not want control over virtually everything? I say this respectfully, but with a hint of resentment based largely on my experiences on the front line trying to execute a sales strategy that is often weak, too complicated, and often disconnected from the reality of the market place I am seeking to sell to. 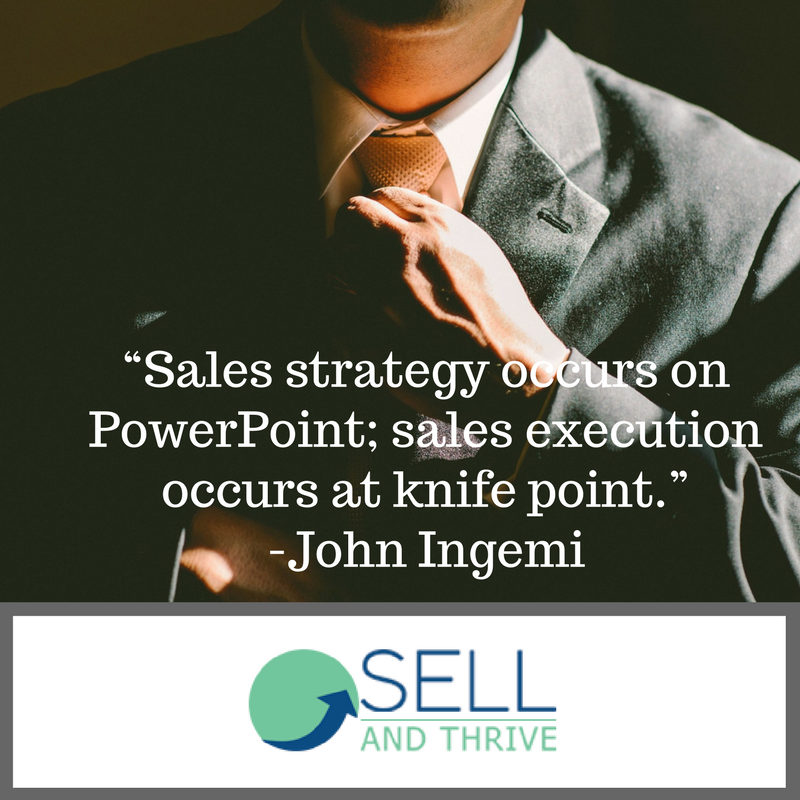 This speaks to a phrase I coined: Sales strategy occurs on PowerPoint; sales execution occurs at knife point. PowerPoint is a safe and easy-to-operate-within environment where do-overs are common by way of using spellchecker, pre-formatted designs, and the delete button. Otherwise known as a vacuum. Knifepoint is up close and personal. It’s live, it’s dynamic, it’s dangerous, and full of unknowns. And most of all, there are no do-overs. I included the word safety because senior management obviously wants to help the marketing and sales teams succeed, or in other words be safe in their efforts so the outcome meets and/or exceeds the plan. Candy/Marketing: In its overarching role of delivering leads to the company, marketing professionals develop creatives in the form of company branding, copy, graphics, event support, campaigns, and much more. Many times, when multi-touch campaigns are being planned, copy—including emails, website landing pages, and sales scripts—is provided to sales. Because marketing relies on data to make informed decisions on current and future campaigns, the script is a measured component. Depending on the sophistication of the marketing team, members will be able to learn if the length, wording, call to action, order of questions or something else, is contributing to or taking away from the goal of the campaign. Are scripts truly valuable to sales reps? Candy/Marketing: Scripts are a tool. Interestingly, there are two components to tools: the tool itself and the person using the tool. Someone can have the finest chainsaw money can buy, but placed in the wrong hands, it’s useless. Conversely, an expert chainsaw operator will be held back operating a poorly made chainsaw. To that, good scripts can be valuable if the sales rep knows how to navigate them. Of course, this begs the question, “What’s a good script?” Ultimately, there are certain components that should be included with a script and a desired behavior (e.g., schedule a meeting, free trial, demo, etc.) that takes place. If the script guides the sales rep to achieve this, then yes, scripts can be valuable. John/Sales: Generally speaking, I would say yes, absolutely. The obvious first value point for a script is that it needs to be written in such a way that it actually helps the sales process move forward and at the speed the sales rep needs it to move at. Sales scripts are particularly valuable (once again if written properly) to new employees because it usually helps them accelerate their learning curve. The value in accelerating a sales rep’s learning curve is enormous. With the right script, a new hire can overcome any lack of confidence and rapidly accelerate the sale cycle. Getting your sales reps comfortable and confident is the foundation for advancing rep productivity. Who should write the sales script – marketing or sales? John/Sales: From my perspective the sales script should initially be written by the marketing team. However, the sales team should be providing the marketing team with regular feedback on the effectiveness of the script. Let’s face it, sales reps are not writers, they are talkers. Really good sales reps are good listeners. Being able to convey to the marketing team how a sales script resonates or does not resonate with a prospect is a critical element to the successful evolution of the sales pitch. Short answer is this is a team effort, but I believe the marketing team should run point on this important task. Candy/Marketing: This article is focusing on sales scripts but there are many sales and marketing activities (e.g., campaigns including emails, direct mail, etc.) that should be developed as a collaborative effort between sales and marketing; not created by just one department or the other. Because sales reps speak with prospects almost daily, they pick up on nuances of the vocabulary used, they hear enthusiasm at certain points and can sense reluctance at other points in a conversation. With repeated efforts, sales reps can understand—and empathize with—the audience, a truly valuable skill to possess. Combine that with the creative wordsmithing from marketing and you have a winning combination. How can an organization create a sales script that sales reps will view as being truly valuable? Candy/Marketing: This is an organizational-level issue that exceeds (and yet includes) the tactic of scripts. Simply put, organizations have bigger bottom lines when sales and marketing are aligned. Having a C-suite that understands the importance of collaboration between sales and marketing is key. At the tactical level, sales and marketing leaders need to help develop the channels for which communication and collaboration between both departments can flow. Work together to define the stages, expectations, and ownership of the sales and marketing funnel (i.e., How is an MQL defined at your organization and how many touches are expected before handing to sales?). If there are weekly recurring sales meetings, invite a marketing representative and conversely, invite a sales representative to a recurring marketing meeting. Or develop a monthly campaign meeting where members of both departments can review current campaigns and discuss upcoming ones. Set up a location for files and ideas such as your company’s intranet or Dropbox. And don’t forget to include both teams for reporting sessions. John/Sales: There are a couple different ways I can answer this question. Once again, a sales script that does not help me move the sales process along at the pace I wanted to move will be far less valuable than one that helps me get to where I want to be when I want to be there. Having said that, as a new hire I will instinctively give the folks who created the script the benefit of the doubt and jump in and use it without hesitation. It’s especially helpful if, during my initial training, I’m allowed to hear other reps use the script live during a sales call so that I can verify for myself that what I’m being asked to use or say will work for me. From a higher level and in a perfect world, the marketing team will know ahead of time what message will resonate with prospective customers. Additionally, some of the very best sales scripts I’ve used are more conversational and have included questions with answers that map to the features and benefits of what I am trying to sell. Example: “So Mr. Sales Prospect, I understand you’re a professional writer. In my conversations with many other writers like yourself, their number-one complaint is that they hate to type. They have told me that the act of typing slows down the creative process and makes writing more work and less enjoyable–less creative. Instead of typing, many writers are now enjoying the benefits and freedoms associated with voice recognition software. Would you like to experience for yourself the freedom and renewed sense of creativity that our voice recognition software can provide you?” Another key benefit to weaving questions into a script, is that the questions also help a sales rep learn more about the product or service they are selling. It literally acts as another training tool. Why do the sales reps often re-write the script the marketing folks initially gave them? John/Sales: Speaking from first-hand experience, the reason I personally rewrote the original script I was provided with was because either it was not effective for me, or I was simply uncomfortable saying what was written down. For example, I’ve used the terms comfortable and confident in this blog to describe the environment in which a sales rep is most productive. For me, common sense prevails. Why would I choose to continue to use a script that repeatedly fails to help me accomplish my goal? Being uncomfortable saying something can quickly erode confidence, and that erosion of confidence can set the stage for failure. The concept that people buy from people applies here in that people can quickly determine if you are confident with what you are saying, or if you are simply saying something that someone else wants you to say. And for clarification I would state that most reps including myself haven’t completely rewritten the scripts they were given. We usually make small tweaks–not complete rewrites–that help us personalize the conversation in a way that makes us feel more comfortable. Candy/Marketing: Marketers aren’t typically on the front lines of any sort of prospect interaction. In fact, the closest some marketers get to customers or prospects is when they hear about a great customer experience and engage that customer for a case study or testimonial. Most marketers, due to the simple nature of their job requirements, simply do not have a direct line to prospects or customers to understand what works and what doesn’t. For that reason, sales reps will often tweak a script to better suit them based on what they’re experiencing in their day-to-day calls. How can sales reps effectively use a script without sounding like they’re reading from one? Candy/Marketing: This is truly John’s expertise, but I would suggest that keeping the goal of the script in mind is more important than reading directly from one otherwise the sales rep will come across as inauthentic and turn the prospect away. In keeping the end goal in mind, for example, if a campaign is launched to better ascertain the stage of the buyers journey a prospect is in, the goal would be to end the call with the stage assigned to the prospect’s name in the CRM. This then becomes the measurable component of the script: did the end goal (CTA) happen? Because sales reps vary in their experience, technique and awesomeness, it’s not a one-size-fits-all solution. Each sales rep works their magic by ensuring they cross the finish line even if the race course is different than their teammate’s. For his character, Dr. Hannibal Lecter, Anthony Hopkins describes how he killed one of his victims by ad libbing the lines — chilling, and absolutely unforgettable. After Jack Nicholson (as Jack Torrance) chops through the door with an axe to get to his family, and then sticks his head through the hole to speak to his family that he’s been chasing around the house – completely ad libbed and terrifying. The first time Roy Scheider’s character Police Chief Brody sees how big the shark really is, he ad libbed this famous line without the cast knowing he would say that. His reaction was honest and underscored the trouble they were in. As Travis Brickle, Robert DeNiro talks to himself in front of the mirror in such a way as to underscore his mental instability. A script wasn’t provided. DeNiro was just told to look at himself in the mirror, but he ad libbed for maximum effect. When (if at all) should a sales rep deviate from the sales script? John/Sales: I’ve touched on this a bit above but to reiterate I think for a sales rep to be effective they need to be themselves. If a sales script is failing completely, or needs some major tweaking I would suggest communicating this with sales leadership and the marketing team. If the sales script is helping you in general terms to move the sales process forward, then I would encourage you to be yourself and ad lib when and if the conversation deviates from the planned path, or if you feel you’re not making your point. After all, salespeople are people first, not robots put in place to say and act like machines. That’s what bots are for. Candy/Marketing: This expands on the question above which is to keep the end goal in mind. Additionally, document your progress, evaluate, and reassess as needed. If you need to make deviations, that is a good time to further collaborate with marketing and share your learnings ultimately with both departments. You may discover that prospects have a perception about your company’s product or service that is very different than what your company thinks just in the words the prospects are using. This information could help unlock stuck accounts and give sales and marketing teams the fuel they need to help shift those perceptions. Sales and marketing alignment is the name of the game if you want to create sales scripts that are used, and valued, by sales teams and help to drive business results. For customized sales scripts, contact us. Candy Osborne is the owner and creative director of Snowbird Creatives, a marketing agency focusing on creating meaningful content for business growth. Candy is a former broadcast and print photojournalist in the United States Marine Corps and civilian storyteller with more than 25 years of experience connecting with audiences to elicit desired behaviors. John Ingemi is the CEO and Founder of Sell And Thrive, a sales process consulting business focusing on helping new and existing companies optimize their sales processes. Sell And Thrive also helps VC and Private Equity firms conduct their due diligence on portfolio holdings both pre and post funding. John is a United States Navy veteran and has over two decades of experience working in sales leadership roles with companies like Compuware, Micro Focus, and Dynatrace. John frequently Blogs about how his experiences with sales processes and tactics from the lens of a consumer, and how they often time intersect with everyday life. As military veterans, it’s our honor to continue serving you with sales and marketing expertise. Great read! and good launch point for a discussion on the “development process” for your sales plan, i.e. the process for introducing messaging and pitches designed to test the strategic roadmap formulated by senior management, but with a process that includes feedback loops that engage all stakeholders (marketing, sales, and beyond). Enlisting the highest level stakeholders in a continuous process to validate and improve their assumptions, objectives (and directives) regarding their sales & marketing strategy, just like an organization would aspire to do for any new product launch. Ready, aim, fire, adjust and repeat. This is the very first time I frequented your website page and so far I am surprised with the analysis you made to make this actual post – just incredible. Wonderful work !